I’ve been involved with dogs as long as I could remember. I started out with ADBA pitbulls and later on got into bulldogs. I started showing bulldogs in Akc for some time. I went on to produce my first champion named ” Romeo”. He went on to become a Multi B.I.S winner in South American. After losing his mother, I moved away from dogs for a year or so. 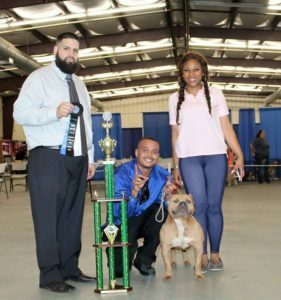 How did you get involved with the American Bully? After having dogs my entire life, I knew I needed to get back into dogs and soon. This was around the time the American bully started to pop up everywhere. Once I saw them I was hooked. I got into bullies a little over ten years ago and started hitting ever show within 20 hrs of New York. The show scene wasn’t really big in the beginning, but seemed to grow overnight. Handling was everything to me. I went on to handle and finish dozens of dogs. 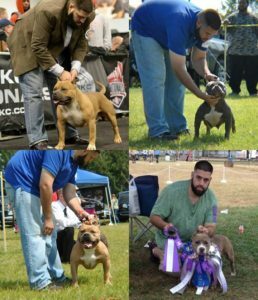 Some of the more notable dogs in our breed such as CH.Bullmaster, CH.Wolverine, GR.CH.Hawk, CH.Sideshow, GR.CH. German Ruger and CH.Spaniard. Although I didn’t breed much, I went on to produce, co-produce, handle & finish CH. Spaniard, CH. Isn’t that a Daisy, CH. Ruckus & GR.CH Obi One Kenobi who completed his championship in 1 event and went on to win Multi BIS with very minimal showing. In 2012 I became a judge for the Abkc. This really slowed me down as far as showing and breeding was concerned, but it was something I felt I had to do for our breed at the time. I went on to judge dozens of show up and down the east coast, mid west and west coast. 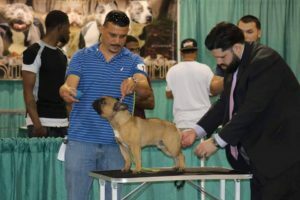 I’ve judged upwards of around 200+ dogs in a single show and breeds such as the American Bully, American Pit bull terrier, American Bulldog, Olde, Shorty Bull and Cane Corso. I went on to judge the first ever Euro Nationals in Spain and a show in Argentina. In 2016 I became a judge for both the EBKC & BBCR. I judged the Euro Championships in Rome for the EBKC and judged the 1st BBCR National Specialty as well as shows in Lima, Peru and Florida for the BCCR. My experience has brought me cross the world looking at various bullies breeds and meeting other people that share the same passion. I hope to continue to help mentor and move our community in the right direction. Can you tell us about about your life outside dogs? Outside of dogs I work with autistic children for a living, which has been a huge part of my life. Some of the children I work with have changed me in so many ways and changed how I view life. I’ve also been training MMA fighters & Boxers for the last 8 yrs or so. This has been a passion of mine since I can remember. I’m also married to the most incredible woman I’ve ever met & we’ve been together for over 12 years now. She’s not the biggest fan of my crazy bully life, but she deals with it and always pushes me to do better. As crazy as my life may be at times, I wouldn’t change it for the world!